Tesoro metal detectors for sale plus much more in the way of information here at my website. 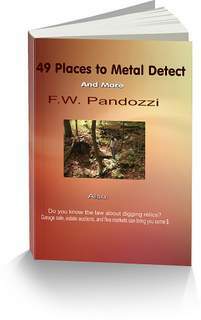 In addition to my Tesoro metal detector pages, there are hundreds of pages of information on metal detecting, and treasure hunting. I hope you find my website interesting and helpful. The links to the Tesoro metal detectors are below. However, first I’d like to give you a brief outline of how Tesoro began. It’s an interesting beginning. Much like another American made metal detector manufacturer. Tesoro metal detectors is located in Prescott AZ. It is owned by the Gifford family. It was Jack Gifford who began Tesoro in July of 1980. But before starting Tesoro, Jack worked for a time at Bounty Hunters metal detectors. While there, he and another employee started their own metal detector business, C&G Technologies. Unfortunately, after a few years, C&G Technologies closed. It was at this time that Jack Gifford went to work at Fisher Research Labs. And then a call from a friend who just purchased Bounty Hunter, asked Jack to come back, and that he did. Once again a situation happened with the sale of Bounty Hunter due to the owner’s health, and that’s when Jack Gifford decided to once again start his own metal detector manufacturing business. In 1981 Tesoro became the first metal detecting company to offer a Lifetime Warranty. That warranty is still a standard in the industry to this day. Yes, Tesoro metal detectors for sale here at my website, and after you purchase one, enjoy the excitement of finding relics in so many areas.